SAN CLEMENTE, CA--(Marketwire - October 3, 2007) - The newest milk TV spot could be a testament to how even traditional advertisers are going to where millions of viewers are spending hours of their time everyday: the internet. While milk has lots of health benefits, it is a drink that's not always top of mind outside the home. This is why the California Milk Processor Board (CMPB) -- the creators of GOT MILK? -- engages California consumers at home and online with a new ad running simultaneously on TV and on www.gotmilk.com. 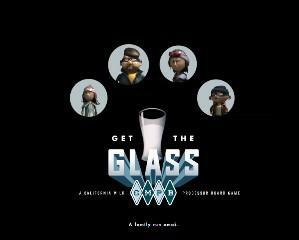 It invites people to play the popular online game called GET THE GLASS (www.gettheglass.com). The 30-second spot narrates the quest of the Adachi family in search of the last glass of milk on earth to cure their multiple ailments and exhorts viewers to log on to the online game to help the family in their quest. "This spot is unlike one we've ever produced," says CMPB Executive Director Steve James. "It shows that even traditional products like milk are using new media to engage and entertain TV viewers and web surfers. It also educates them about the benefits of milk." The University of Southern California Annenberg School Center for the Digital Future reports that 79 percent of Americans 12 and older are online today (1). The Census Bureau also notes that an average American now spends close to 200 hours on the internet every year. "We need to capitalize on the growing internet use," says James. "Viewers' short attention spans and the popularity of DVRs and TiVos make it difficult for today's consumers to learn about milk and its healing powers in a traditional 30-second spot. Now, people at home have the opportunity to be engaged by visiting www.gettheglass.com, and playing a fun, 3-D interactive game online." Earlier this year, The New York Times reported 66 million Americans play games online. Because of its popularity, advertisers now spend $150 million advertising on casual online gaming sites, more than double the amount from 2002 (2). The article further stated the fastest growing segment of gamers is women over the age of 35. While people commonly associate online gaming with teenagers, statistics now show it's an activity for people of all ages. The new TV/web spot is running throughout October and, like the online game, it was developed by longtime CMPB advertising partner Goodby, Silverstein and Partners of San Francisco. Since its launch last March, www.gettheglass.com has been viewed by one and a half million unique visitors from all around the world with more than 10 million page views. For more information on the GET THE GLASS campaign, visit www.gotmilk.com. The California Milk Processor Board was established in 1993 to make milk more competitive and increase milk consumption in California. Awareness of GOT MILK? is over 90% nationally and it is considered one of the most successful campaigns in history. GOT MILK? is a federally registered trademark that has been licensed by the national dairy boards since 1995. GOT MILK? gifts and recipes can be viewed at http://www.gotmilk.com. The CMPB is funded by all California milk processors and administered by the California Department of Food and Agriculture. (1) The Project for Excellence in Journalism. "The State of the News Media 2006: An Annual Report on American Journalism." http://www.stateofthenewsmedia.org/2006/narrative_online_audience.asp?cat=3&media=4 4 Mar. 2007. (2) Louise Story, "More Marketers Are Grabbing the Attention of Players During Online Games," The New York Times. 24 Jan. 2007.